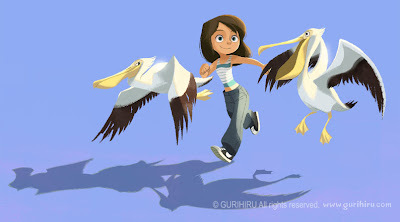 I submit the pelicans a recent drawing for this weeks Illustration Friday. Nice and fresh, I love it! Awsome illo!! greetings from Mexico! Great work and cool style... you have a new follower! Great work! I have to second (or is it double(?)) everything everyone else has said. I specifically LOVE your style! Lots of energy, color and expression! Nice illo! Love the pelicans. it seems they have fun. I like your style. This work is brilliant..love the rendering and use of colour. Very cute. I like the way you used the shadows.